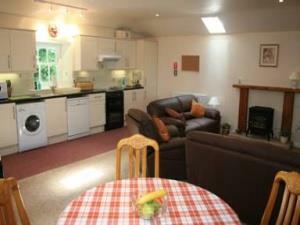 Cosy, well-equipped cottages in converted stables in woodland on the 10 acre Heaves Estate. Close to Kendal and ideal base for touring Lakes/Dales. Arrival after 15.00 on Saturday, check out 10.30 Saturday. The cottages are situated in the grounds of Heaves Mansion. This former hotel is currently closed so no food or bar facilities are available. Children welcome from any age. From M6 jct 36 follow A590 towards Barrow for 3 miles. Take first exit at roundabout, follow signs for Barrow. Take second junction on the right for Heaves. Turn immediately left into drive. Train, mainline London Euston/Glasgow to Oxenholme station 3 miles away. Bus, 555/556 Lancaster/Keswick, ask for Heaves Hotel/Force Lane. The questionnaire has been filled out for Coachman's Cottage which has the most steps. All the cottages are different and some have parking directly outside, separate showers etc.